Investing is a skill most can’t learn from a book. The alternative of learning in the ‘real world’ could prove costly. You need to first understand your own behaviour. The CASHFLOW 101 game was created by Robert and Kim Kiyosaki, the founders of the Rich Dad Company. Robert Kiyoski is the author of the best-ever selling personal finance book of all times, Rich Dad Poor Dad, which has been on the New York Times Bestseller list for over 7 years, translated into over 30 languages. Cashflow 101 was created as a fun, powerful and experimental way to teach investing and wealth building, manage assets and liabilities, trade stocks and fight your way out of the rat race. 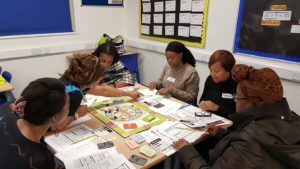 This game will help you gain the knowledge on how to be wealthy and that with be life changing. Be the boss and find out more about yourself financial styles and know if it matches your opponent. Sharpen your financial literacy skills and relearn the concepts of investing and making money. Perhaps if you are the saving type, try out forceful investing. If you like taking risks, maybe try to do steady growth. The CASHFLOW 101 is a simulation of real life. The CASHFLOW 101 is a simulation of real life. There will be a short presentation on Financial Literacy before the game followed by information on business opportunities available to delegates to earn passive income. Register your place on our CASHFLOW Session today! Places on these workshops are non-refundable and non-transferable.